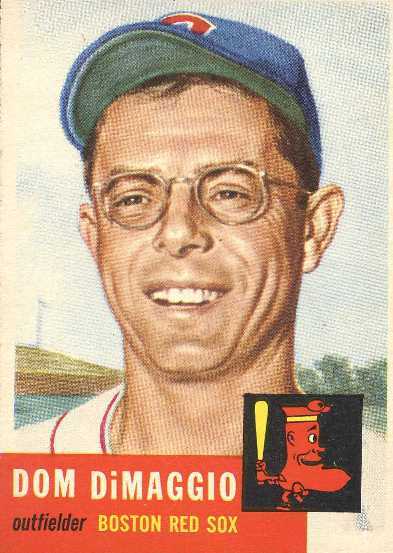 Probably the only thing Dominick DiMaggio couldn’t do better than his older brother was play baseball. He was a better student in school, a better husband, a better father, and a better businessman than his more famous sibling. Of course, most veteran baseball pundits will point out that you could count the number of players who ever played the game better than “Joltin Joe” on the fingers of one hand. Younger brother Dom had quite the game himself and in fact, he’s on the roster of just about everybody’s all-time greatest Boston Red Sox team. Dom’s biggest handicap was his small size. He was the runt of the DiMaggio litter, a full five inches shorter and 25 pounds lighter than the 6-foot two- inch, 193 pound “Yankee Clipper.” As a result he couldn’t hit the ball as far as Joe or run quite as fast so instead he learned how to do everything else that could be done to help a team win a baseball game. One of the great statistics I uncovered during my research for this post was that no other hitter in baseball who played during the same 11 seasons as “the Little Professor” did, had as many total base hits during those years. Dom batted .298 lifetime with a .389 career on-base-percentage. He was a seven-time All Star and is among the top ten in most of the all-time Red Sox hitting categories. He was also an outstanding defensive center fielder. He scored 1,046 runs and don’t forget that he lost three seasons in the prime of his career to military service. Dom retired in 1953 because his Red Sox Manager, Lou Boudreau felt he was past his prime and benched him. He had just come off a .294 season in 1952 but he didn’t need to play baseball to make money or to be happy. He ended up settling in Massachusetts and became an entrepreneur, starting and partnering in several successful businesses. He passed away at the age of 92 in May of 2009.